With a long list of hikes to my name throughout the Rockies, Northern Spain, Torres del Paine in Chile, Argentina, and now Alaska, I love to hike. Throughout my travels, I enjoy using my two feet to get me to the road or path less traveled. This summer, I have been hiking and sharing my stories of hikes in Alaska; however, I have asked Katie Green to comment on some of her hiking recommendations in the US as well as planning and preparing for your hiking adventures. Without further adieu, Katie the virtual floor is yours. The geographical size and diversity of the US means that, in terms of hiking, there is pretty much something for all kinds of tastes. From rugged mountain scenery to coastal trails and seemingly endless plains and forests, the variety on offer is enormous. Hikers can therefore find many different experiences, but they should also be aware of some important basics concerning safety. Many of the best hiking trails in the US can be reached using cheap flights domestically and internationally. The best option is probably to find an official hiking trail in the sort of environment that appeals to all members of the hiking party, and to make arrangements based on that. There are many hiking trails with top national and international reputations. In Utah, the Zion Narrows in the Zion National Park feature a trail through spectacular slot canyons that have been naturally eroded into the rock. 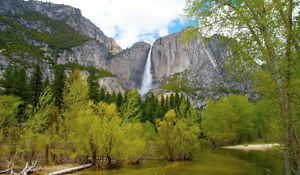 In California, the weeklong John Muir Trail starts in the Yosemite National Park (Yosemite Falls shown above) and takes in glaciers, mountains, and lakes. For a day-trip, the steep Chimney Tops trail in the Great Smoky Mountains of Tennessee and North Carolina is a short but strenuous circuit. The national parks across the country offer information on a multitude of other possibilities. The best advice in hiking is probably to choose a trail that suits the hiking party physically and that provides the sort of experience that the hiking party wants to enjoy. A hiking trail that is too physically challenging brings health and safety risks, while a trail that the hikers find dull risks a loss of motivation. The terrain, the length, and the scenery of the hike should all be assessed for suitability. Another key element is the weather, and a hiking trip calls for research into the local weather, spanning from seasonal norms to detailed checks on local weather forecasts. If a route is prone to flooding, for example, then it is essential to check the weather conditions before setting out. If possible, it is best to avoid extreme weather in all cases. It is also necessary to dress and pack according to the climate and the condition of the trail. Clothing and footwear that is suitable for both the climate and the terrain are essential for any hiker. Good boots and socks, plus ventilated waterproof clothing and extra layers for warmth, are important items in any circumstances. It is also necessary to carry a rucksack in which to pack supplies. These supplies should include at least sufficient drinking water and food, such as energy bars, for the duration of the hike or trail stage, and a basic first-aid kit. A map is another must, along with a flashlight and a cell phone. Depending on the local conditions, sunscreen or insect repellant may also be necessary. The focus is on staying comfortable, healthy, and safe, while being able to get home or call for assistance if this becomes necessary. ** Sponsored post written by Katie Green, a freelance writer who loves travelling and meeting new people. She is currently interested in travelling to Asian countries and planning to visit some of them next year.